In a survey (MySciBlog survey 2014, by Paige Brown Jarreau, Louisiana State University) of over 600 science bloggers, participants were asked to list up to the top three science blogs, other than their own, that they read on a regular basis. The resulting dataset was mapped in Gephi, and laid out according to a ForceAtlas 2 algorithm. 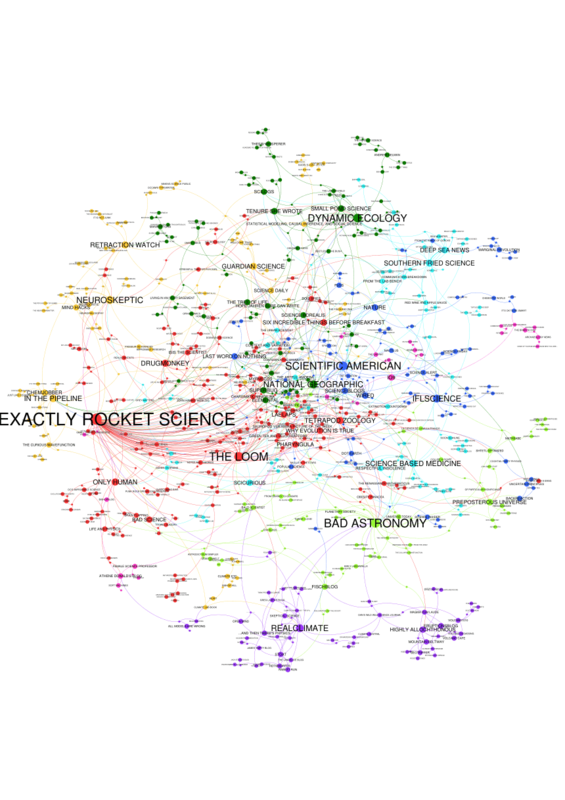 Each node represents a science blog (either a survey participant's blog or a blog listed by a participant). Communities (represented in color-coded nodes) were detected automatically in Gephi with a resolution of 3.0. Nodes and node labels are sized according to in-degree (how many times the blog was listed by other bloggers as regularly read).